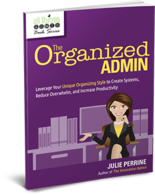 It’s Admin Appreciation Month at All Things Admin! And we are so excited about all of the awesome training opportunities and admin recognition events happening for you in April! To help you keep track of what’s available, we’ve created our annual Admin Appreciation Month Celebrating Admins page to keep you connected. How recently have you updated your resume? What is the state of your LinkedIn profile? Do you have a professional portfolio of work samples? The responses have been quite concerning. 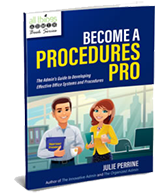 Only about 20% of respondents have a resume that is current and ready to submit. About 30% of respondents haven’t updated their resume for years! Approximately 25% of respondents don’t have a LinkedIn profile, or haven’t updated it in years. 85% of respondents do not have a professional portfolio of work samples. Your resume, a LinkedIn profile, and a professional portfolio are the three most important tools of your career toolkit! And you need all three of them ready to use at a moment’s notice. 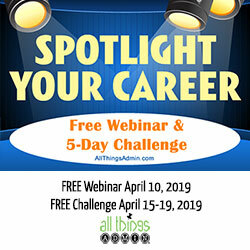 So, to help you proactively put the spotlight on you and your career, I am doing a free webinar and 5-day challenge to get you started with your portfolio development process! In order to get both the webinar and 5-day challenge for free, you must register by Sunday, April 14! After April 14, there will be a fee to participate. Throughout April, we’re going to be focusing on you and the administrative profession by sharing some of the fabulous feedback from our #AdminProud survey. My team and I have been enjoying your responses immensely, and we can’t wait to feature some of them on our website and social media. Make sure to connect with us on Facebook, Twitter, and LinkedIn to share in the fun! P.S. Your personal brand exists – whether you manage it or not. From your social media page updates to the emails you send, and even the way you set up your workspace – all of these things (and more) reflect on your personal brand. 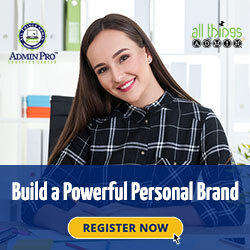 Register for this AdminPro Training Series webinar to learn how to define and enhance your personal brand!